Sylvie Bantle is a German writer, a costume designer and a visual artist. 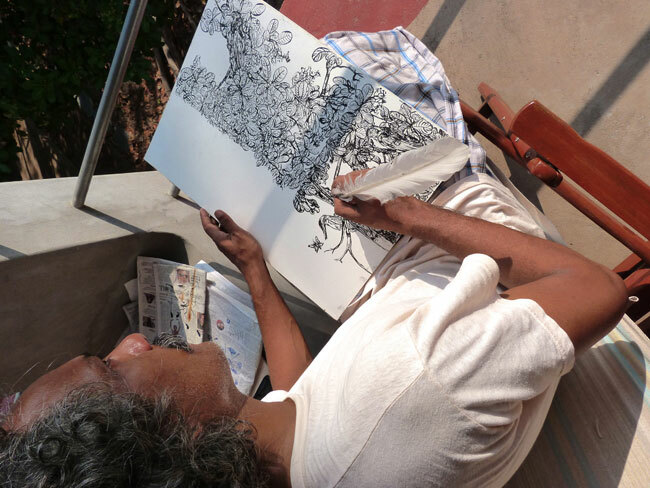 After travelling the length and breadth of America, Africa, SE Asia and the Pacific, she came to India by land in 1977 in search of old culture , where she met her soul-mate Alexander Devasia, a veteran contemporary Indian artist and film maker. Together they made a trilogy of documentary films – 'Mortuary Joseph', 'Shanti Bhavan' and 'Chakara' – the first one winning an award at the Tokyo Film Festival (2000). 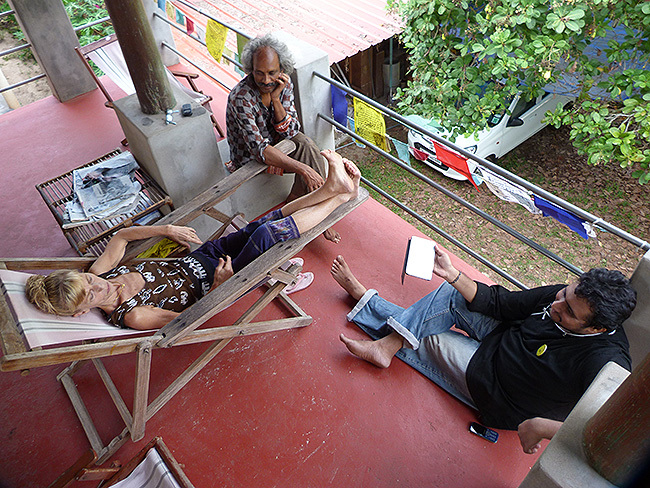 On a sunny afternoon, the concluding day of the 43rd Wellbeing camp on April 10, 2015, Eswar Anandan, Friends of Tibet Campaigner, engages in a friendly chit-chat with them. EA: How you met, was it in India? 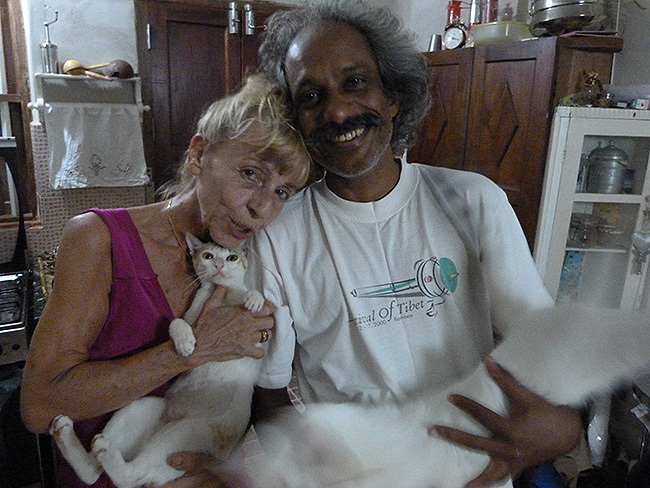 Sylvie Bantle (SB): We met in May 1992 at the Samudra Beach near Trivandrum. During my visits to India, I always stayed there, writing. Alexander came with his artist friends, whom I too knew. We started talking immediately. He was planning to go to Munich, where I lived. We exchanged addresses. He was invited by a professor in the academy there, the professor had been to his exhibitions in Mumbai. But this did not work out, because he was supposed to learn German, which he didn't. He was lazy (Smiles)! In November 1995, I was looking for a publisher and I met this publisher who read my manuscript for the novel and felt it was too big for his small publishing company. In January the next year, I went to Samudra Beach and started writing again. My First book published in 1997, was a review about my 20 years of travel to India. I understood I was attracted to this place; I have travelled a lot – America, South America, Africa, South-East Asia, but nowhere I felt its still resembles the old world, which I felt only here in India. I felt it sinking in front of my eyes and now it has sank completely. I wanted to speak with artists and intellectuals here. That's when I remembered Alexander and wanted to touch base with him. But his address was at my home, so I made a mental note that I would write a postcard to him once am back home. At the same time, while I was sitting and writing here, Alexander found my address in his magic box and sent me postcards. Three months later when I went home, I saw his postcards. It was the spring of 1996 and we exchanged letters. In 1997 when I came back to India again, we met and I stayed here in Alleppey for one week and we decided to make a documentary. I bought a camera and we met in Bombay during his exhibition. I started to train myself, exploring photographic styles. That's when we fell in love and it was very clear from the first moment. It happened very fast. When I saw him outside the glasses of airport, that moment I felt like hit by a pressure wave! His family understood it much earlier, because whenever a letter arrived from me, he got a very special smile in his face. So they understood before we understood. My First book, 'Happiness of the Fools' had the title written in Malayalam – 'Mandamarudeyum Mandikaludeyum Santhosham'. EA: Is this the book where there was a world map. In that book the world map showed Tibet as part of China? SB: Yes. But I was not conscious about it. 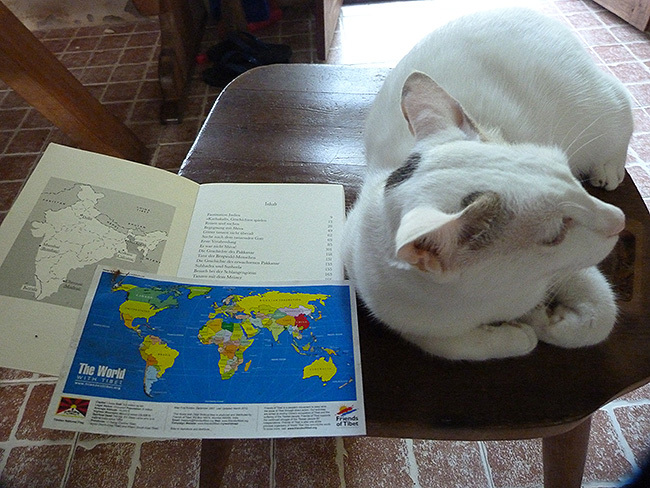 The publisher felt that I should make a map which showed my route from Germany to India by land. I needed a bigger map, so I took my atlas from my school time. I did my schooling in the late 60s. EA: So this map you had put in the book was from the 60s atlas, which showed Tibet as part of China? SB: Yes, That was from my school atlas. I still have it here. I put a transparent paper on it and drew the map. EA: Just curious, so at that time you did not know about Tibet? SB: No, I did not know about Tibet. Yes I know about the different countries, but I have not seen them yet. My first trip to India was by land, reached Amritsar, then to the northern part and from there I went to Kashmir till Indian Tibet to Ladakh. I knew there was Indian Tibet and there is another Tibet, and no more. I was around 22 then. AD: I know in childhood, that there is a country named Tibet, in the mountains. EA: You also felt its part of China. AD: Yes, because the Chinese occupation of Tibet happened before I was born. SB: I was not conscious that it was a part of China, I got to know only later. It was not in my route and was just around, so I was not very conscious about the situation. AD: The main issue is that, there was never a war, it happened in a very peaceful manner. There was no big protest from Tibetans; in our part of the world, there was no much attention about the issue. SB: In 'Indian Tibet' – Ladakh, there are huge Tibetan monasteries, so I went around walking, I was in these monasteries, and I did not know there is a trouble or something. I was also in Nepal, some days hiking, and at that time there was no hotels or guest houses, back in the late 70s. I used to stay with other people in a room, sometimes in a dormitory. Have also stayed with Tibetan people, that's when I first tasted Tibetan Butter Tea! For me, in my imagination Tibetans were living in North India and Western part of Nepal. I did not know much about the issue then. EA: You mean about the political issue? AD: We were not aware of the situation. EA: You have widely travelled, how did you get attracted to India? SB: When I was 21, I went to America by accident. Then I proceeded to Mexico, Canada. Since my childhood I was interested in Asia. As a child of 9 years, when I was babysitting my younger sister, I knew by heart to draw the map of Asia! In the 60s people in Germany only travelled to neighbouring countries like Austria and Netherlands, and if one has travelled to Italy it was very far! So when I was drawing the map of Asia, there was an elderly woman sitting next to me, who could not recognise what I was drawing! At that time, though there were aeroplanes, people used to travel by land. There used to be car smugglers from Iran who needed passengers like me. They could only do this once a year. So when they meet travellers like me who needed to pay for passport for customs, they offered free trips to Iran through Austria, then Bulgaria, Greece, Turkey and then Iran. I had to stay with a family in Iran for two weeks. From Tehran I reached Afghanistan, and then Pakistan from there travelled to India. I was always fascinated to Asia, for no reasons. No one in my family had such dreams. EA: It just happened, may be you were destined? SB: When I look at it now, there are many articles which talks about how people, especially children can remember former lives. May be I had previous roots in India and that's where the magnetic pull was from (Smiles). I also had a photo of Mahatma Gandhi by my bed. My Parents were conservative. There was no discussion about travelling this far. And then after I travelled for over 6 months, the whole of India, Sri Lanka, Maldives, Nepal, I wanted to go further the next time. The next year I went to Thailand, Malaysia, Indonesia for 6 months and suddenly I missed something; later I got to understand I missed the old world, India is the only country which I have seen, where the old world is still alive, and its true. The civilisation is old by tens of thousands years. Old Egypt, Sumeria, Rome is gone, but here there is a thread from the past. When I wrote my first book in the mid-1990s, I felt this thread was slowly sinking and I felt am witnessing the old world is sinking, now I can say it has sunk. But once u fall in love with something, then your memory keeps going on. I often question myself, would I come again and again, would I fall in love for example with Kerala, if I come now the first time, which I don't know I can't answer, its completely different its nearly 40 years. That's a lot, how much that changed you know! At that time it was just a normal life from normal simple people, practicing diversity. America and Europe, they started mono-culture a long time back and it followed in their mind too. I felt here it was still very open, conscious that you are just a human being and a visitor for some time in the form of a human body and that we are all part of a huge cosmic world. This teaches you a bit of humbleness and that you are connected with everything, tree, this cat, birds, water; everything is connected. This I felt when I visited the first time. Now no more, the younger generation, there is no more wideness of mind, diversity in mind. So I came here again and again and again! EA: When did you first hear about Tibetan medicine? AD: We heard it from Sethu Das when he came to Munich. That was a time when Sylvie was diagnosed with Cancer and was operated and we were undergoing a tough time. SB: That was in 2004. AD: Sethu Das, a good friend of mine, asked – Why don't you try Tibetan Medicines? He explained briefly about what Tibetan Medical System is, how it works and affects the human body and mind. At that time it was a complete mystery to us, if it would help treating Cancer. Since Bangalore was the nearest Tibetan clinic to us, we visited the clinic in 2005, as per Sethu's advice. Since Sylvie prefers alternative medicines, we tried and there were no side-effects, which was more important. After the surgery, Sylvie was undergoing Homeopathy treatment, that's when Sethu Das recommended that we meet Dr Dorjee Rapten Neshar, Chief Medical Officer, Men-Tsee-Khang, Bangalore. SB: I have known or heard about Tibetan medicine before, heard it as Chinese or other form of alternate medicine which uses Traditional medical practice, but I did not know anything about it. I knew its existence but did not know someone who practises Tibetan Medicine. Since my 20s I was into Homeopathy treatment, so naturally after my surgery, I went for Homeopathy treatment. Through Sethu Das, we came to know about Tibetan Medicine and in August 2005, we met Dr Dorjee Rapten Neshar for the first time. I had a good feeling and a very fast feeling of strengthening after taking Tibetan medicine. A friend of mine saw me and was surprised. She had seen me before and after I took Tibetan Medicine and she said "Oh my God! You look again live. Before you looked like a glass or transparent", and I felt from inside some power emerging. That was also my constitution that time, what Dr Dorjee found out. That all my organs were in a sleepy weak mood and that's why cancer had a chance. He explained how it worked and further explained that when all your body organs are working strong, working with good energy, then cancer has no chance, because body defends itself! EA: What was the experience, how did it make a change in your life. You told you felt better and your friend opined you looked better – that's external. You also mentioned that you felt more inner strength; any changes it made or your perspective of life changed? SB: I was always interested in alternative healing methods. Since my 20s I only went to a Homeopathy physician. I started reading some books on Homeopathy. Tibetan Medicine is another part of healing methods which is also interesting and may be it makes complete what I researched and experienced. I also am interested in astrology which can tell about one's weakness, physical constitution and I feel this is all connected. Tibetan medicine helped me understand in a holistic fashion my body, mind and I felt from inside, a rowing physical strength. (Turning to Alexander) Can you say something about the changes you saw in my life because of Tibetan Medicine? AD: We enjoyed taking this medicine and we felt confident to go further. Quality of life changed once we started taking Tibetan Medicine, because in one side there is healing and a very positive side is that thereis no side effect. We are happy about the medication. SB: I think confidence is a good word for that; two younger sisters of mine also got breast cancer, when they checked their blood, the doctors also examined the genes and they said my sisters had breast cancer genes inherited from parent's side. Initially I was confused if I need to undergo the tests again, but it came very clear to my mind that I would not. Because the physician there had advised them that if you have this gene, then you may also get affected in the ovals and womb region. And a surgery was recommended. I did not want to undergo a surgery. I discussed this with Dr Dorjee and he instilled confidence in me, he said we keep you strong with Tibetan Medicine! I felt strong and secure with this medicine. Once am strong physically ad emotionally, my body can defend by itself! Thanks to Tibetan Medicine. I also read in some studies that when it comes to healing, the relationship to your doctor plays a very important role which helps in the healing process. This is something that modern medicine does not consider. The doctor can initiate self-healing powers. The Traditional medical practice looks at a wholistic way, which the Tibetan medicine doctors do. This is very important and that is what they do. So confidence is a very important factor. EA: Alexander, this is a question for you, this is regarding the Wellbeing illustration that you had drawn, which we had printed in our Wellbeing newspaper carry bags. Can you please tell us the story of the Wellbeing illustration? AD: Based on my knowledge and what I understood from others, Wellbeing is everything that you connect with nature. Wellbeing is synonymous with nature. 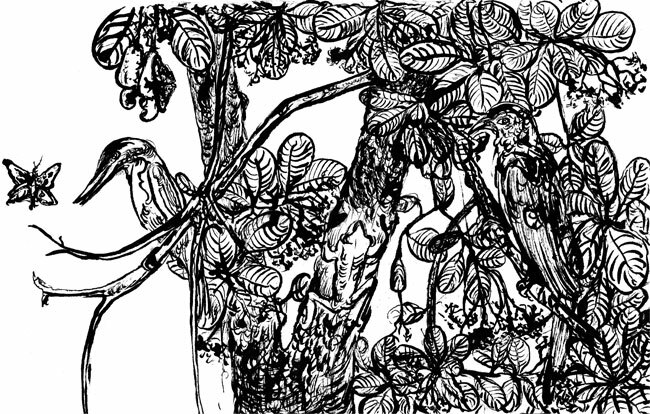 Whenever I see this cashew tree, its fruits, the butterflies and dragon flies that flutter in, I see this in very close detail. This gives me joy and I enjoy that moment; when there is joy, there is Wellbeing! This is the best motivation fore me to draw. There is harmony in this, and that's what I drew for wellbeing. AD: I drew this illustration more than a year back. I enjoy the sight of the flowers, the cashew fruits, the butterflies. To me it's about being close to nature, and that's Wellbeing. Whenever people think about Wellbeing, they think abstract, which I feel is not practical; if you really see things you can connect with nature, and it's an art in itself! EA: How long did it take, was it in a single sitting? AD: About half an hour. EA: You are specialising using quills? AD: Now it's all factory-made, (Smiles) but its waterproof. EA: What was the feeling when you drew and when you saw the outcome, because it conveys the theme of Wellbeing! AD: You are bound with nature, you are close with birds, butterfly, dragonfly and nature; that creates lot of energy in me and makes me feel happy and brings joy in whatever I paint. It's a wonderful feeling and that is Wellbeing to me. I always paint themes based out of nature. EA: But after you completed the illustration, what was the feeling, the immediate feeling? AD: No, it was more spontaneous. Sethu Das asked if I can draw something based on the theme of Wellbeing. I always drew nature, a part of the tree, leaves, rain, nature in general. This was something I always wanted to portray in my paintings, the fruits, tree full of leaves, butterfly and that's what I have portrayed in the wellbeing illustration. EA: How do you feel when Wellbeing participants are actually able to visualise the theme of Wellbeing through that illustration of yours? AD: One naturally feels happy on seeing beautiful things – be it the sky, a tree, beautiful smile of a woman, a colourful butterfly. When there is happiness, there is Wellbeing! It's that simple, no complications, we are very closely associated with nature! EA: Sylvie, you were able to see it live, we have only seen it sketch...! SB: He was sitting here, (Pointing to the arm chair), I took photographs of him. EA: How was your feeling looking at the Wellbeing Illustration? SB: I enjoy when I see Alexander sitting here and drawing. It's a nice place with a beautiful view. He often sits or stands here with his easel and I enjoy seeing him painting. He paints a lot on the theme, leaves, water drops, nature, and trees. I had written an article which was published in the Friends of Tibet website, documenting the illustration. When we wake up in the morning, and when we don't have the noise from the nearby Church, it's just nature, and it's similar to what we experienced this morning! I never get tired seeing the morning light. When I wake up, the first light passes through the trees and I close my eyes… then I feel, "Ah! I must get up, it's so beautiful!" and this beautiful nature urges me to get out of the bed, to stand and see and experience. This is wellbeing to me because it gives me so much pleasure experiencing it! EA: Do you have a message for the Wellbeing Participants? AD: Wellbeing means 360 degree in all levels, our house, how and what we eat, how we smile, how we pamper nature. It's all connected. Our House especially, where we live, the air flow, birds, trees; just like the birds fly in and out, air needs to flow in and out with ease. Limited usage of electricity, fan, air conditioner, and make more natural air flow in. Use traditional materials which does not affect the nature we live in, grow lot of herbal plants and trees. Many people who come here, say, 'Oh this is like a Wellbeing house'! SB: Wellbeing is a result of love, when I designed Sylviander House, I was in love with this place. I stand here and get in contact with this place, all of a sudden I felt that the construction has to be 'L-shaped' so that the wind that comes in and its flow is not disturbed. The house comes later we come later, but nature was here already. I love nature and I want to live in harmony with this nature and also get benefitted from nature. The material we use, when we put poison colour, or very expensive fancy colours, then people will be impressed, but this is not love. Because if I love myself, that's something everybody should do – loving oneself, then I give a good surrounding; when I lay there and sleep and I inhale air, it comes from natural wall, and not from poisonous expensive paints! AD: For me message of Wellbeing is not to do anything drastic to nature, every step, every action gives a reaction, let's not create an artificial nature, and let it grow. Let's not force nature, it would create a negative impact. Wellbeing is to enjoy nature! EA: Earlier you benefited from wellbeing or Tibetan medicine, Later you experienced Wellbeing Camps. Now you are the host of wellbeing camps. How do you feel about it? AD: When we constructed the house, we had a slight idea we should do something related to the Tibetan cause. We talked our wish to Sethu Das, who welcomed the idea and together we started the institution – Centre for Social and Political Art (CSPA). Not long ago we benefitted, we got something from Tibet, now it's our turn to help people benefit, and we too experience it. SB: For me it's a very fulfilling feeling, am still getting benefit from Tibetan medicine and now we can give benefit to other participants. Since young, I had a dream of a big house, in a big land; not for myself, of course I would want to live there, but it should it should have guest rooms where there is space for artistic and cultural purpose. Later in the end of my 20s and in my early 30s my interest with regards to health, wellbeing and alternative medicines grew more. So when we started to build this house I also I wanted to do something related to these topics. At that time, I did not think about Wellbeing Tibetan Medical Camps, since it was too early. They were located in Bangalore at that time, we did not imagine something like this would be possible. I had an idea, and even spoke to my Homeopathy doctor in Munich, that one day I want to gather them and host a symposium of alternative medicines. This thought process just got stronger and now its fulfilled, it's very satisfying, the circle is now complete. It's about giving back what we got and experienced, and this makes me very happy.